This link was forwarded to me by Steve Bartin at Newsalert. Political scientist Larry Sabato has his take on not only the Presidential race but on US Senate races around the nation. For this post I'm keeping my focus on Romney v. Obama (and yes I intentially wrote it that way Obama is the champ and Romney is the challenger it is how they do it in boxing correct). Remarkably, after a year of intense campaigning, this election is not in the bag for either major-party candidate. 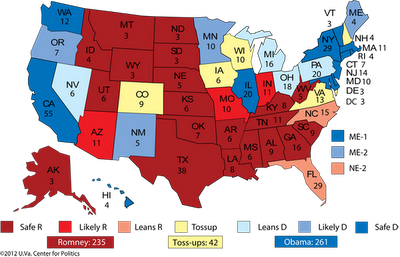 It remains on the edge of the butter knife; the state polling averages tilt the Electoral College slightly to President Obama, and the RealClearPolitics national polling average moved into an exact tie late Wednesday afternoon. On top of it all, a fierce Super Storm intervened, acting as a circuit-breaker that stopped campaigning dead in its tracks for several days in the election’s last week. Have Obama’s presidential actions in the wake of the storm, so highly praised by Republican Gov. Chris Christie of New Jersey, had an effect? Will Friday’s unemployment report — whatever it may show — push the small percentage of remaining undecideds off the fence and toward one of the candidates? This election is going down to the wire, and we will issue our final Electoral College predictions, as we often do, on Monday, the day before the election. In our private conversations with Democratic and Republican leaders, we see two diametrically opposed visions of the electorate — almost parallel universes — and two visions of how the election will shake out. Unsurprisingly, the Democrats AND the Republicans are confident of victory for their party in what is a close presidential contest. Democrats see favorable demographics and sturdy leads in enough states to get Obama over the magic 270-vote mark, while Republicans discern rumblings of a 1980-style wave that will not only ruin Obama, but also drown Democratic Senate candidates and ruin the reputations of many pollsters, particularly on the state level. We still see eight true battlegrounds right now, the same ones we have focused our readers on for over one year, with just one addition: Colorado, Florida, Iowa, Nevada, New Hampshire, Ohio, Virginia, and Wisconsin (the latter added after Paul Ryan’s pick for VP). Well I shall keep an eye out for the final electoral college prediction and then post it here. It will likely be one out of many from various sources. I wonder what the FiveThirtyEight blog's predictions are. In 2008 they were able to predict an Obama victory as well. In the meanwhile check out the current Electoral College prediction map above.